Today’s episode is one of those stories, when you hear about them you gonna have your mouth wide open and think “how is this possible”? You know that I love projects that really challenge the status quo, so I made my way to Friedrichshain, walked into the backyard behind Berlin’s famous electro club Watergate, right by the river Spree - to visit Jan Edler, one of the founders of Flussbad Berlin. 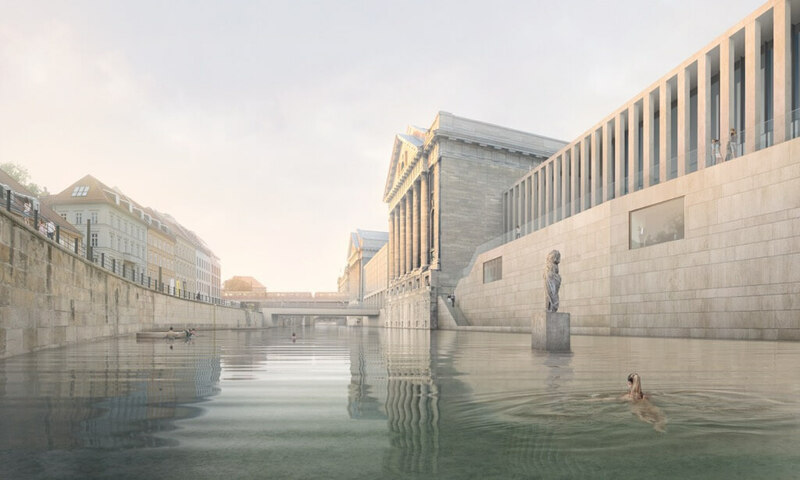 If you haven't heard of the project, Flussbad Berlin is about to create a natural swimming pool in the river Spree, just along the UNESCO site of Museum Island, so in a very static, historic area of the city… And you can imagine that some people get excited about - and some throw their hands up in despair. It’s been incredible to meet Jan. He is such a fascinating character & he was so open about everything. He made me see the project in a completely different light: It’s not just gonna be the world’s biggest swimming pool... The swimming is the side effect, but what it’s really about is re-accessing a lost part of our city. We traveled in time back to the 1920’s, over the exciting times of the post-Wall era, where everything seemed possible… times that made utopian thinking and ideas like Flussbad possible - and also a time that created that unique Berlin sense of freedom that still exists on (at least a little bit) todayWe talked about all that and so much more. And of course: when we can jump in! But now, I’m not gonna keep you waiting any longer, enough intro… Lean back, open your minds and ears & let’s get into the show! As always, it would be awesome if you could hop over to iTunes, subscribe to the podcast and leave me a short review (just click on the cover image in iTunes and then on "Reviews"). Tell me how you like the show, it’s what keeps me going. Hey, what’s up everyone, thank you so much for tuning in today. I am joined here by Jan from Flussbad, which is an incredible project - and he’s going to tell you everything about it in a bit. Jan, welcome to the GreenMe Berlin podcast. Thanks so much for coming on. Thank you for letting me be here. Pleasure! I’m so excited - which I often am - but today it’s special… Because you and your team are working on one of the most exciting urban development projects in the city! I remember when I first heard about Flussbad, I think it was in 2014. I was still working at the visitBerlin office… And I thought, wow it sounds beautiful, these guys have a big vision there. But at the same time it seemed also bit too good to be true! I’m actually quite amazed how far we got as well. Because, for quite a long time it looked like a project which would be absolutely unrealistic to consider to become reality. And where are we? Basically, we are working on the project, but it will take a while until we can go swimming, or hope to swim. We are aiming for 2025 right now. The water is still dirty, but it’s also not dirty everyday. What’s an important thing to understand about the project: we’re not trying to claim to construct a huge swimming pool in the city centre - but rather trying to make use of a void. Berlin has always been dealing very pragmatically with the river in the past. There’s always been different needs like fishing, transport and things like that, and defense. And usually, when a certain function was not needed anymore, you got rid of that stretch of water. Because it didn’t make sense anymore. So for instance, in 1680, there was a defense ring around Berlin. You know, it was this typical star-shaped thing - that’s where the S-Bahn is running nowadays. Because there was a space to build it. They got rid of the water and could build something else. And the Spreekanal, that was the former shipping route which ran through Berlin. There was a harbour in front of the castle, so it was a very very busy situation, while the main Spree - which is the Northern side of the Spree island - that was for energy production, with mills. But when the steam engine was invented and the mills weren’t used anymore, or needed, it was a pragmatic decision to move the shipping towards the other side of the island. And that’s basically when the Spreekanal lost its original function. Nowadays, it’s not possible to go through there with the ships, because there’s no functioning log anymore. So since then, it has been forgotten. Today its mainly used for high waters, or floods. 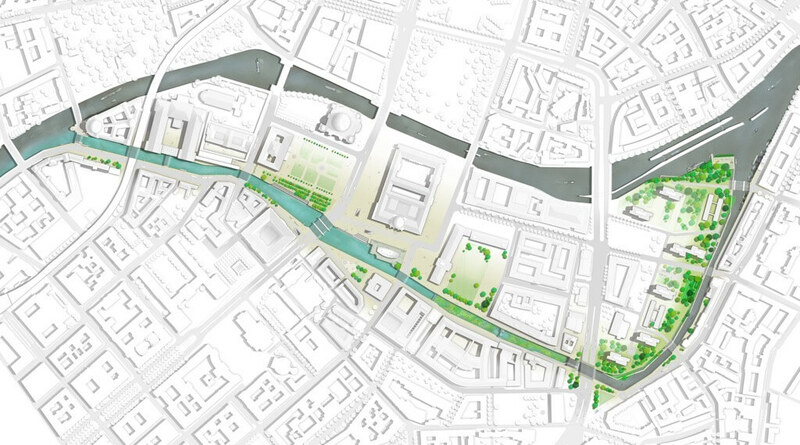 When we have lots of water to push through Berlin, the Spreekanal has a certain value… And, of course, for getting rid of the overflow of our canal system. And that’s the actual reason why the water is not good. But that’s only happening 15-30 times a year. Usually, when the water arrives in Berlin, the Spree is quite clean. Then it’s good for swimming - and people also do. The problem is caused in Berlin itself. That’s basically happening through this mixed sewage system - then the water gets poisoned. ​Ouuu. You were saying that some days its clean and some days it’s not - was that what you meant with that? Exactly. As I said it’s around 15 to 30 times a year that this happens. It’s a very standard way of canal system, which you have in most cities in the world. It means you have one pipe in the street, and you collect the rainwater, as well as the waste water from the industry and from the households. And then, when it rains very heavily, the capacity of that system is just not large enough to transport everything into the plant. So it spills into the river and periodically, the river gets very poisoned - and that’s a big problem. Medieval times, I would say. Okay, so: basically the canal is 2km long. The swimming section is approx. 800 meters long, from Bode Museum to the foreign ministry. And we clean the water, as I said. That’s at the middle section of the canal, between the Foreign Ministry and Leipziger Straße. It’s nearly 400 meters long that stretch and here, we will have a natural plant filter. A very traditional way of cleaning water - but usually not in a river. So it’s a bit new in that sense, that we try to clean all the water that is coming through.It’s a sand bed, where the water is pushed through. There’s a weir in the river and we have a height difference of 1.5m. And this 1.5m, where the water falls down, gives us the power to push the water of the river through the sand. And while the water is pushed through the sand and the filter, it’s being cleaned. It’s being cleaned by bacteria that are growing in the sand. And you call it a plant filter, but the plants actually do not really filter it. They supply oxygen to the bacteria on the ground, so they survive. So much force in nature. Yeah that’s how you clean water, when you drill fountains at the edge of rivers and want to get drinking water. That’s actually how water is being cleaned there. So it’s a very traditional way of doing so. The only special thing is that we are doing it in the river and we’re trying to clean the complete river. Wow, that sounds amazing. You turn back to pretty old techniques and just adjust them on a bigger scale, on a bigger project… I’m super curious to know: how did you come up with the idea? Was it on a night out, or did you play a round of “wouldn’t it be cool if…”? Yeah, it was a little bit like that. It was me and my brother and we were working as part of this art association called Kunst und Technik, which was also a night club. It was this after-Wall time in Berlin... We were having a bar and a beach bar - one of the first beach bars in Berlin. Oh nice, where was it? Right next to the Bode Museum, where you can go tango dancing today. So there was the location of our building. It was the former animal testing lab of the Charité hospital. We had a 600m2 building and we used it to do art exhibitions and we had our studio there, with nine people working there, and we had the bar. But it was not a drunk idea - it was rather being there every day and having the canal in front of your eyes, realizing that it’s not being used. And you have to imagine, looking back it was a time where every little bit of the centre was being discussed. How it should look like in the future, how it should be used like. So it was this time of transition. And even though this was one of the biggest voids nobody was talking about it. So Tim started thinking what to do with it - and that’s how the idea slowly developed. "the idea would be unrealistic enough that we can discuss about it without any prejudice…"
And that shows very clearly: it was being sensed as a crazy idea. At that time, Berlin had very different problems than thinking about the river and if it was possible to swim in the river. It took a long time for the transition of the perspective of people of what is the river’s function in the city. Is it for shipping? Or shall we look at the river as a natural resource and as a living thing in the heart of our city?I think that’s the transition point we have: everybody wants to be at the river now. And we would like to build this extra step to access water - and get in. Yeah, it’s exactly what you say: the river is there and of course you can take a walk along - but it feels kind of a bit detached from us. There’s so much water, and water is giving us so much good energy... So you’re building something that’s good for everyone: for the Berliners, who can claim back a little piece of nature in their city, what we need so much. But also for visitors, it’s gonna be nice when Berliners come back in and create a mix. Not only having this static tourist area, but also drawing in locals again. Have you always been a bit of a utopist, a dreamer? I don’t know. We do have a studio where we do kind of unusual projects I would say. We’re both trained architects, but we don’t do proper architecture. We somehow do projects on the borderline between art, architecture and communication. We’ve been doing that for 20 years and Flussbad is our oldest project. And it’s definitely the biggest project, and also the most urban project. Okay, now I’d really love to go a bit further into the “WHY’s” of Flussbad. Because I think this is such a cool, future thinking project to clean and green our city - and could potentially inspire other cities out there to follow maybe. Therefore, what are the major reasons for you to do this. What drives you, gets you excited - and keeps you going, for so long? That’s a good question. Because, of course, the project has not only friends. There’s people who are very sceptical about our approach. 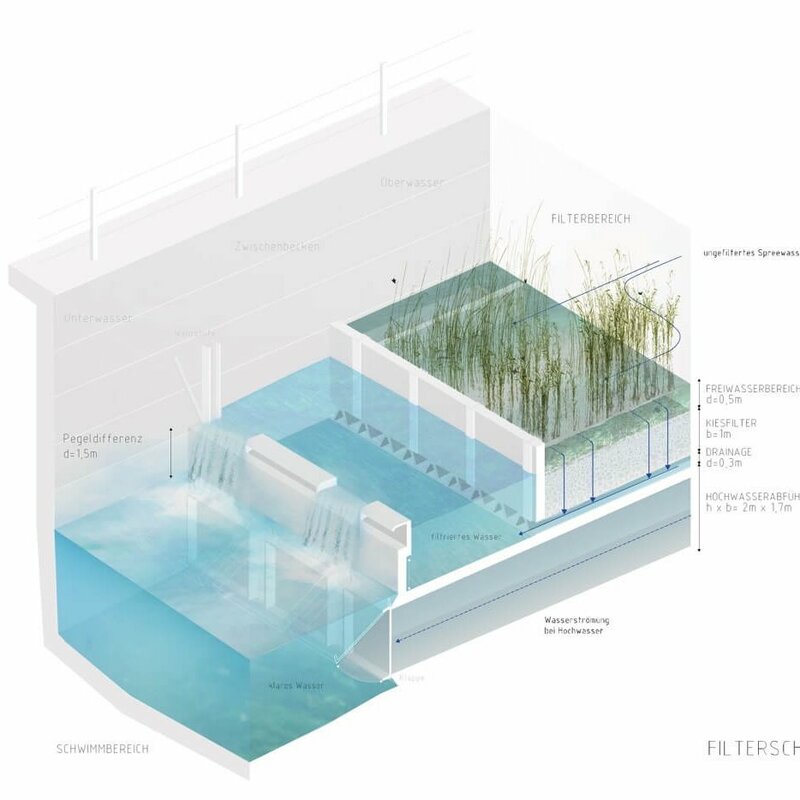 In the first place, people always try to limit the project - and it’s our own fault, because we called ourselves Flussbad Berlin, which is kind of focussing on the swimming… It’s reduced to the idea of this urban pool. And that’s actually the least important aspect, from our perspective. We like the idea of swimming, of course. But as I said, we were not swimming fanatics who try to find the best location to go swimming in the very centre of Berlin. It was more about discovering this very huge space in the city, which was not being used. Exactly. So there’s a lot of museums and tourists and all that is very important for the city, of course. It’s good that we have that and we can be proud of it. But at the same time, we know the images of city centres that have become museums themselves and where there is no life anymore. And we’re hoping that Flussbad is one way of implementing this very simple but authentic piece of life. Which brings different people to the city centre, where they can actually meet. That’s why for me, the staircase we wanted to build by Lustgarten - which has been discussed a lot… It’s a Schinkel wall and the heritage protection people go bunkers looking at that image, because we’re destroying Schinkel wall. We were very naive and for us, it was this metaphor of having a meeting space, where people gather and can access the water. I think, from today’s perspective, we do not depend on that staircase… but that’s at least one thing that is driving me a lot. But there’s also other aspects that go along with it. There’s definitely the whole idea of the sustainable development of our cities. We all know that it’s one of the most important themes that we have in order to redevelop the cities for the future. And to convert them to become sustainable - or more sustainable at least. And we think that Flussbad can be this tangible element, that you can have in the city centre and where people understand how sustainable development can actually feel and look like. So it’s not abstract like solar panels on the roof or having wind turbines standing at the edge of the city. It’s something that people can touch, feel and relate to in a very direct way. And therefore, the location is also perfect. Of course, Museum Island is one of the most valuable things we have, it’s there to look at how society was formed, is formed - and maybe also how it’s formed in the future. Maybe it’s the very location where we should discuss important things like that. Yeah, it’ll draw a lot of attention. People will see it, they will be right there. And as you say, it’s also a government area, it’s a tourist area… But then, when it’ll draw back in Berliners, it’ll be hopefully a place for meeting, exchanging ideas and thinking about the future. You were also saying that you were dealing with a lot of front wind, people who don’t believe in it, who put obstacles in your way... Tell me, what’s your major challenge. What gives you a headache sometimes? Just one thing. Erm… One thing I mentioned already, which is to marry the idea of having the Museum Island and the Flussbad. "From my perspective, I do not see any reason why swimming in clean water should be worse than having sewage." At the same time, it’s not that it’s on Warschauer Straße or so. You probably won’t have a bunch of drunken tourists coming out of the clubs and just jumping in. Yeah, but that’s the picture that people paint. And of course, we also argue that we try to bring different people to the city centre. I think that’s a very interesting discussion, because sometimes, you get the sense that one of the main fears is that the wrong people might come. And the wrong people is the picture of drunks, party people and, you know, all these people suddenly coining the city centre in a complete different way. Of course, you will also have, once in a while, drunk people who party there at night, yes. But you have that all over the city. "And I think we should not limit ourselves, or the future of our city, by downregulating ourselves in possibilities because we’re afraid"
Fear is not a good partner here. You rather need to think about transforming it in a good way. And the right design, urban design will be an important part for that. The right alliances with the right partners on the shore… How they behave and integrate a project like that… So it has many aspects. Berlin is also a cold city in the winter. So we’re talking about a quite small period of the year, where it’s really that attractive to go there. And I think, maybe, once in a while it can be really crowded, yes, and it’s good. You know, then it’s very lively! But I think it’s no reason to completely push the idea aside. Are there any times where you think “ah, you know what, I think it’s too hard, I don’t wanna do this anymore”? That was also the point where we decided to form a non-profit association, which is Flussbad Berlin e.V. It was founded with 15 people at that time. And we thought, if we want to land that project for Berlin, we need to transform it to become a project not only for Berlin, but also made by Berliners. 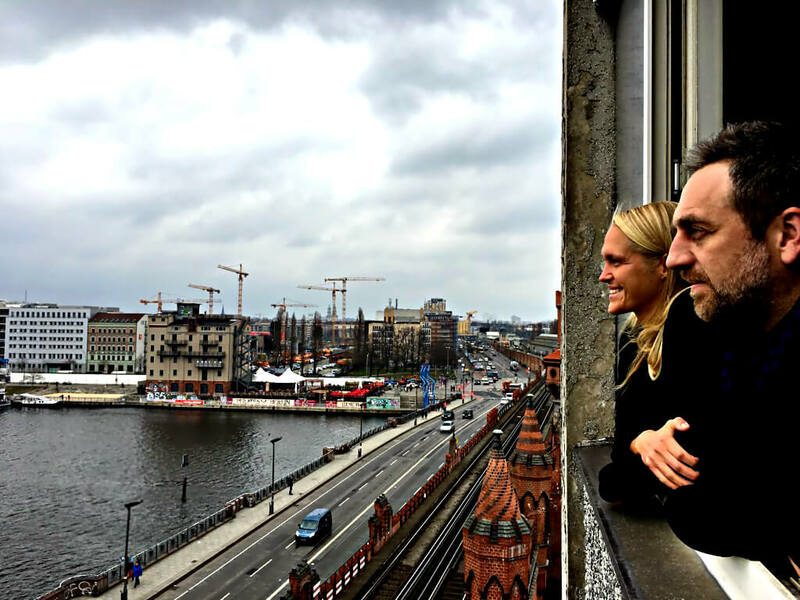 And then, in 2014, actually it was the Berlin senate that approached us and said: There is a new program called “Nationale Projekte des Städtebaus” (=National Projects of Urban Redevelopment) and we want you to apply with us. Oh good, so they approached you? They approached us. So we teamed up and we had never written a proposal like that in a very short period of time - and we applied for 4 million euros! And we actually got it. My god, how was that day? How did it feel? And then it became really stressful for a time. Because, you have to imagine, the Flussbad association, until that day, was basically a few people doing a hobby. "We didn’t even have a computer or telephone - and then we suddenly had 4 mio euros"
How can I or the people out there can get involved? There are many ways. It is important to become member of our association. We do need the money to further keep going… The funding we have nowadays, it’s a lot of money and we are very grateful that we can use public money in a way like that and we try to do it very properly. But of course, the focus of that money is very strict and it does not allow for us to keep out association alive. ​Oh, but I think there are a lot of Berliners and more and more and more people, who also… Berliners LOVE to be involved in their city. Is there anything you offer them, that makes it fun and gets them engaged? Yes, we try to engage them in activities. 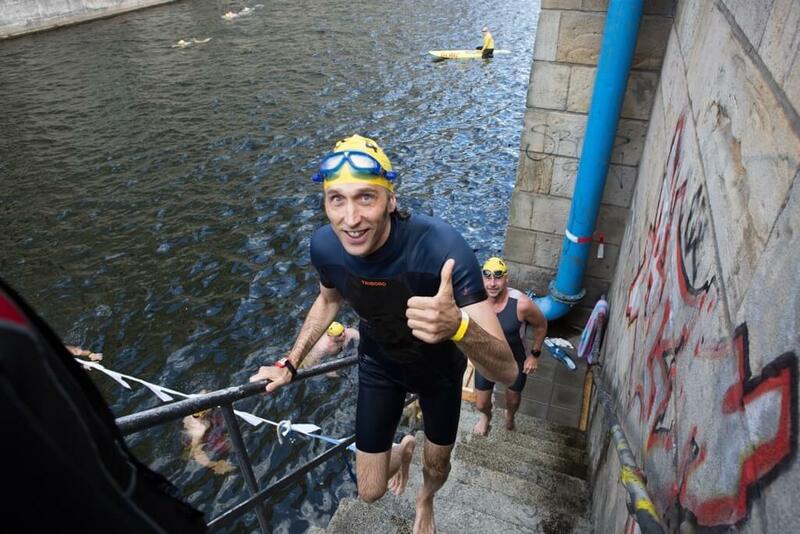 One of the most important ones is the Flussbad Pokal, where we go swimming once a year. When is that happening? In summer, right? This year it’s happening on July 2nd, I believe. If we’re lucky again. It will be the 3rd time. But we depend on the weather - it cannot rain heavily beforehand, because we need to test the water to make sure the water quality is ok.
And that means, when it’s okay, then people can sign up for it and jump in and go swimming? There is a competition in the beginning, where you swim 1000 meters and you can win the Flussbad Pokal. 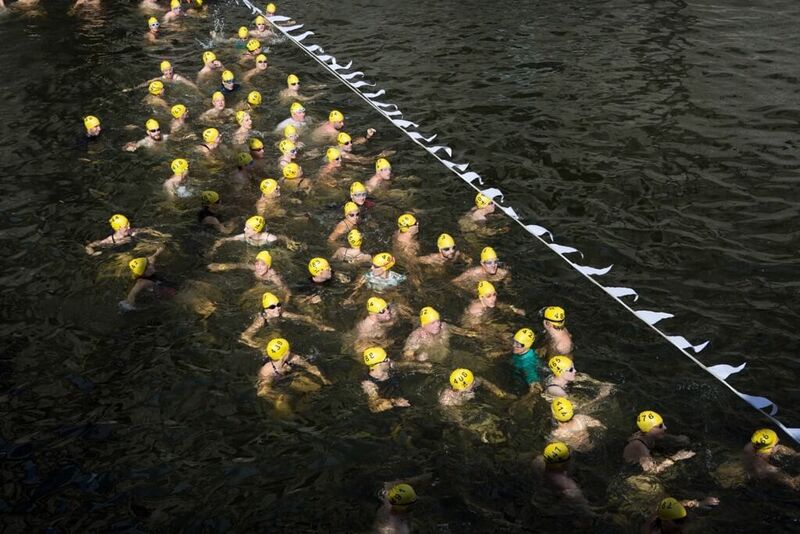 And afterwards, this year we will have a less competitive event as well, where we allow people to test-swim the canal on the full length for 3 hours. It will be like a free swimming… So there’s a lot of people involved. And this is also where the association members help, with this event, that’s very important. But what I wanted to say, and that brings me back is: of course, the money is important, but also the fact, that we are a growing number of people. We founded the non-profit back in the time, because we said “If enough people in the city do want that project, then it will become reality”... which I think is a fair way of looking at it. "We need to become many, and if we’re enough, then the project will happen!" And that’s the most important driving force to become a member. So you must sign up, it’s not expensive. It’s cheap, it’s from 30 euros per year. And it’s worth supporting it. Awesome! So you guys out there, if you want to support this amazing project, I’ll put you all the info into the show notes. Go, go go! Be part of it, get involved. And spread the word, exactly! That’s really important… It’s about… Yeah, it’s basically about creating a movement. It’s a community of lots of passionate, future-thinking, like-minded people - and they need YOU guys. Alright, now let’s switch direction a little bit and talk about the amazing city that makes all of this possible… Why do you think that Berlin is the right place to realize utopian ideas like Flussbad? True, it’s getting harder. But at the same time, I think that there are so many people out there, who actually always keep searching for this space. And there is still a lot of space.. I mean even, people would think that there’s no space at all in the city centre - but you found a space there that’s unused. And it’s still always moving all the time. Maybe we’ll have to move out a bit. But somehow I have the impression that people search for spaces - and if you really open your eyes and your mind then you’ll find them. Yeah of course. One of the big potentials is that Berlin has a very large creative community, which is good to exchange and to meet interesting people - and I also love living in Berlin, don’t get me wrong! and just let your ideas and creativity flow. Yeah, that’s a big potential for a place - and of course, it cannot last forever and I have full understanding that the city needs to move on. You were speaking of the big creative community - In terms of collaboration and exchange: how do you feel about the situation within the Berlin green scene? Not from a political side, but really other actors who are passionate about sustainable development. Is there enough exchange and mutual support? Do you think it could be more? What’s your opinion on that? I think it’s working really well. People know each other and exchange and there’s also certain formats where you try to meet each other. From my perspective, that’s working quite well and I’m always surprised how many people are out there, who have an amazing amount of energy to do things… And that’s great! I mean it’s a good location for that. Yeah, I have the same feeling. Through the website and the podcast I’m very lucky to meet quite a few of those passionate people, who really give their all to make the city greener, drive all this development, make it fun… It’s really great. What makes you feel really excited about the chance of… actually re-shaping the city and leaving your mark here in your home town ? I just really think it’s a good idea. Now we have gone all that way - and basically, now we want to do it! I also think it’s the right time. We are lucky that the new government in Berlin has chosen to include the Flussbad in the new coalition contract. Awesome! I didn’t know that. Yes, it’s in there, so it’s an aim for Berlin now - an official one. That doesn’t mean it gets realized. But right now, from the positive feedback we get from that side, I believe it’s the right time… let’s do it! Awesome… Huge respect for your guys, definitely… I’m not gonna stretch your time for too long anymore. Just a few questions that I ask all of my interview guests. First thing: Since you started Flussbad… like, 20 years ago, wow… what was your biggest learning so far? Your biggest aha-moment. I’ve been thinking about that quite often. And I think there’s many things. Really many, many things. But from my perspective, the most amazing feeling is, that it’s worth keeping on track. It seemed very unlikely for a long time that this project could actually become a project for Berlin at a certain time. As I said, it was seen as a utopian idea - and now, everyone talks about it as a potential realization project. Exactly. It’s very close, feels very real already. Yeah, that I think is quite amazing and is a big learning for me. That, sometimes, it’s good to keep pushing. Yeah. It’s such a good takeaway, really for everyone. I mean, there’s a lot of people out there with really smart ideas. And it can be tough sometimes, you think you run against a wall - and lots and lots of people are just giving up. But you are definitely the proof, that it’s worth to keep going. And if you have this big vision in front of you, which is obviously important to pull you I guess… that’s great! Right, then: If you could change one thing in Berlin within the next 24 hours - what would it be? Haha, yeah, I was thinking that. Yeah. And what is a question I should have asked you but didn’t? Erm, there is this one thing, which I think we haven’t talked about and which I think is interesting about the project, or the current development of the project is that we will actually arrive on site this year. So, we will have an information platform and a small café in the project area. We’re lucky that the European School of Management and Technology allow us to use part of their garden. It’s right next to the canal where we want to swim. It’s a beautiful heritage-protected garden and it has not been publicly accessible so far - so we kind of unlock the potential of that garden to a certain extent. And we do that on a very special location, because it’s a place where one of the former historic river baths was located in the city. And that’s maybe the aspects you haven’t been questioning about:Is that a new idea? No it’s not. Because Berlin has been using the river like that 100 years ago. The last swimming facility closed in 1926. There were approx. 30 facilities to swim in the river - of course, it had a different focus at the time. The people needed these public areas in order to clean themselves, because they had no private bathrooms. It was basically “ships”. So it was swimming facilities, you could go in and you had a changing-room-sized thing, and you had like an opening in the ground where you could go into the water, clean yourself and go out again. So very indiscreet. But there were also real swimming places along the river. And there was a swimming facility right in front of the castle. We got an image of that. Oh, you gotta give that to me. That’s amazing! And it’s linking back again to this, you don’t always have to reinvent the wheel, but just look what worked in the past and then adjust it to our situation today. Last question! f there was one thing you could pass on to the GreenMe Berlin community - what would it be? Communicate! That’s what keeps us going. Communicate the idea, join us for events we do, come along and discuss the project and get involved really. Become part of the association, it’s the most important thing. And I think, if we’re many, we will do it! Yeah! It’s a really, really nice and empowering way to finish off. Jan, I can’t say how much I respect and admire you guys. You are showing up everyday, dedicating so much passion and energy to this city and the people living here. It’s truly inspiring - and I can’t wait to see you at the opening of Flussbad, surrounded by all these happy people who - thanks to you and your team and your hard work - can re-access a lost part of their city. I hope that many people get inspired and get involved. And I wish you all the best and lots and lots of good energy. Power through! Thanks so much - and you need to come swimming with us this year. I count on you, July 2nd! Oh yeah, great idea, definitely! It’s marked in the calendar. And I put all the important dates and everything in the show notes, so people can read up about it. Thanks so much again, hope you have a really nice day! I absolutely believe in the success of this project, and hope you are too. And I’m definitely gonna join the Flussbad Pokal and go swimming on the 2nd July. Are you in? Come on it’s gonna be awesome - do let me know, write me an email, ping me on Facebook and let’s do this. As always, you’ll find everything you need to know in the show notes at the bottom of this page. So check them out - and share the Flussbad episode with your friends, cause you heard it: they can only do it if there’s as many people as possible. And also communicate with ME. I wanna know what you think about this episode - and about the podcast in general, if there’s something particular you wanna hear about... Getting your feedback always makes me super happy - so get in touch, write me, or share your thoughts in the comments right at the bottom of this page. How to become an association member (German) - also possible as gift! P.S. If you wanna stay up to date with the latest interviews, green events and fresh content from me and my explorations around going green in Berlin, then sign up for my monthly newsletter. I got a little thank you if you do so, I’ll send you my best-of guide to 7 of my favorite eco-minded places in the city. To get it, just go over to the Guide Book section and you’ll find it right on the top. HEY, WHAT DO YOU THINK ABOUT THIS AMAZING PROJECT? DID YOU ENJOY LISTENING TO THEIR STORY? Would be great to hear from you! Just share in the comments, right at the very bottom of this page. Oh yes Lutz, you totally captured what the Flussbad is all about. It will be completely freely accessible, and a huge asset for natural life coming back into a rather static part of our city. See you at the Flussbad Pokal then 😉 ?